Samoa Parrot Finches or Pink-billed Parrotfinches, Erythrura cyaneovirens cyaneovirens, occur naturally on the island of Viti Levu in Fiji, where it is found at mid-height along tree-trunks and branches, usually alone or in pairs. They frequently join mixed-species flocks foraging for food - which is primarily insects, but also includes flower buds and fruits. Common on Efate ... Identification: Green back and a dark red head. Endemic to Western Samoa ... Identification: Has a duller blue neck. Size: Averages 11 cm in length. They have a red head, a blue back and chest which gradually merges to green. The hen is duller in coloration and the males have a clear change to the head color on the back of the neck. This species has an over-sized bill compared to its size, and is easily recognized by its large, glossy-pink bill. 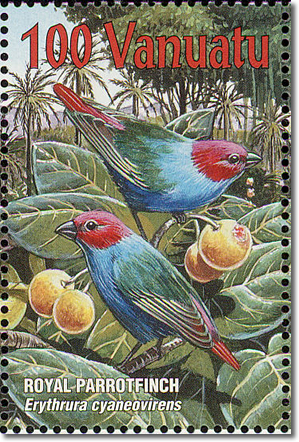 They look similar to the Royal Parrot Finch, but the Samoa has a greener back and the blue coloration is paler. Also the Royal Parrotfinch has a stronger beak. They are larger in size than the Peale’s Parrot Finch. It has high-pitched chee-chee voice and a clicking sound. The two factors that seem to be very important for this finch species is the provision of a spacious aviary (more important than with other parrotfinch species) - some sub-species may also require figs as part of their daily diet. It is always advisable to have more hens in your colony than male birds, as it minimizes the potential conflict between males. Having said all that, give them food, water, and nesting material, and they are likely to thrive and breed. If within your aviary, you have the facility to grow a seeding grass, then you are guaranteeing yourself a happy flock of parrot finches. In their natural habitat, they eat mainly a wide range of fruits. Some sub-species may also require figs as part of their daily diet. As these finches spend a lot of time foraging on the ground, breeders can expect to have to deal with a worm burden. Some breeders suggest that these finches do not respond well to worming, while others suggest the following protocol: "Mix 80 mils of water, 1.5 mils of Avitrol Plus, 2.0 mils of strawberry topping. The strawberry topping seems to make it more palatable without affecting the efficacy of product. Use your own judgment on whether or how often to administer. In most cases, 3 or 4 times a year seems appropriate, particularly if you are feeding live food. " Whether or not such a routine is advisable for your own birds should be discussed with your vet.